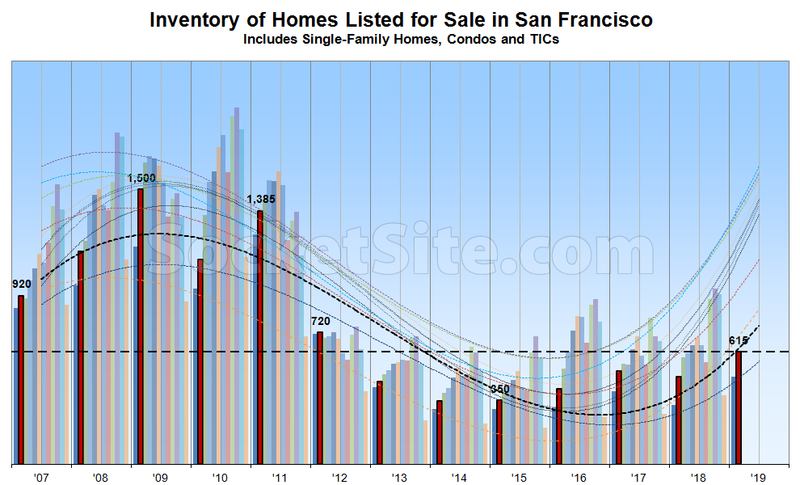 Muted by the holiday weekend, the net number of homes on the market in San Francisco (615) was relatively unchanged over the past week but remains 28 percent higher than at the same time last year, 76 percent higher than at the same time in 2015 (350) and a 7-year seasonal high. 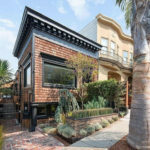 At the same time, the percentage of listings in San Francisco which have undergone at least one price reduction has ticked up to 16 percent versus 13 percent at the same time last year. And the number of homes in contract to be sold is currently down 17 percent on a year-over-year basis while the average list price per square foot of the homes in contract is running around $930, down 1 percent versus the same time last year. Does anyone know the average price per square foot for new construction? I was told it was running around $1450.00 by a Redfin agent about 9 months ago. I get that questions a lot, especially down in South Beach. You really cannot average it out in my opinion, different buildings have different premiums, views all come into the calculus. For instance, in The Harrison, the stack of units exist on multiple floors, the highest with the best views will be getting the premium and higher $/SqFt. It all comes down to what you are comparing. The situation in SF is a stalemate between buyers and sellers, hence plummeting volumes and plateauing prices. [Sellers] can’t let go of the story that their stucco homes or “luxury” condos are worth millions, and [buyers] will not (or cannot) pay market prices when there are many great areas with great tech jobs outside the Bay Area. Prop 13 makes it easy for many sellers to “hold,” but what buyer wants to assume the reset property tax liability when it seems like confidence in price appreciation is waning? I’ve really been wondering about this fact…particularly since the SALT deduction was limited to 10K. It will be an interesting year. Homes/condos are stilling flying off the self, relatively speaking, throughout the greater Bay Area. Months of supply is the preferred leading indicator here: the low transaction volume touted by the editor is partially balanced by low inventory. I’m sure months of supply is increasing too, but it’s nowhere near bearish territory. Things can’t really fly off the shelf when the shelves are so close to empty. That’s incorrect with respect to “months of supply,” which is actually a terrible metric, being “the preferred leading indicator.” Regardless, as reported above, the shelves in San Francisco are now nearly twice as full as in 2015 while transaction volume is…down. I would appreciate more detail in your correction. Deferring to authority, Calculated Risk has repeatedly said that it is his preferred metric. When I looked at the math, months of supply seems clearly superior to measuring either inventory or transaction volume alone. There may be something better, but from first principles the ratio incorporates more information about the market than either the numerator or denominator separately, and since the two are correlated some of the noise should cancel. What is your argument against it? To your second point, personally I wouldn’t anchor anything on an outlier year like 2015. IIRC, Calculated Risk considers 6 months of supply to be a normal number. A doubling from 1 to 2 is worth noting but is still a very hot market. Right on cue. While “6” months of inventory has been a lazy industry standard for a “balanced market,” that’s a metric based on national stats. And applying the “6” month metric to the San Francisco market isn’t only misleading, but it’s factually wrong in terms of the historic ratios at past inflection points in the market. First off, do you think the story for this cycle has been about supply or about demand? I think it’s been demand, with a huge demand wave pushing up prices with demand now slacking off. Maybe some housing downturns are caused by an excess supply shock, but I don’t think that’s the case here. Secondly, if you do believe this oft repeated maxim that it takes more then 6 months supply to “cause” prices to drop. Was this true in SF last time? Did months of supply surpass 6 before prices dropped in the 2007 cycle? And what do you think is going on with all these “bad apples” we’ve seen? Why have sellers comprised on pricing faster then even any of the biggest bears here would have predicted even before months of supply surpassed 6? Consider that what months of supply could really be an indicator of is the spread between buyer and seller expectations. If sellers capitulate fast enough on pricing then you won’t see supply build up. Demand is not slacking off right now. It is increasing. If inventory is up strongly and transaction volume is down, how do you get increased demand from that picture? And all of this is with weakening apple-to-apples pricing? If this is all ‘Fake News’ is Toll Brothers in on it too? Because I am staying on topic, and talking about San Francisco. Demand is simply higher than it was in the late summer and fall. I’m not sure what you’re doing with the straw terms and the scare quotes or why you felt they’re necessary. Seems rather juvenile. And yet, both pending (see above) and closed sales (i.e., actual demand) are down. The December sales data does not contradict my point, actually. I stated that demand was down in the fall. Then you’ll begin talking about 2020 and what it forebodes. Once again, pending (i.e., current) sales activity remains down and the January numbers will show a sizeable drop, which shouldn’t catch any plugged-in readers by surprise. Regardless, we’ll continue to focus on the actual data and emerging trends at hand. January still won’t be current. Where do you get your pending YoY statistics? We maintain a database of pending sales, based on actual contract activity. January sales are typically considered to be reflective of the winter, not fall, market and activity. Regardless, we’re not expecting February sales to be up either. We’ll soon see, (who’s) right? Of course January is considered winter. Nothing in my language would indicate the need for such pedantry. So just to be clear, while “demand is simply higher than it was in the late summer and fall,” as you stated (and subsequently re-stated), a substantial decline in January sales won’t contradict your claim, despite reflecting post-fall demand, because it’s “not current,” but February sales will definitely be higher, on a year-over-year basis, reflecting the “simply higher” demand? Okay. But based on the actual data (i.e., pending and closed sales activity) versus a feeling, and taking into account basic seasonality, demand is still down (including over the past week alone). It’s not just a feeling. It’s observation. But do stick to your lagging indicators, and your database nobody gets to see, while talking about the present and the future. At the risk of suffering another pedantic! barb, pending sales and movements in inventory levels (see above) tend to be a leading, not lagging, indicators. And we only used “feeling” as that’s the word you used and it doesn’t appear you have any actual data sets to reference. Barbs are not flat. The January comment was pedantic enough that I felt the need to point it out in plain language. No hard feelings. Anyway, I provided a series of numbers a week or so ago, comparing neighborhoods YoYs. It will be interesting to look back on this time. Happy to do so with data when it comes available. Looks like someone is cracking open the same real estate industry playbook that was used during the last downturn! One of my NYC colleagues sent me this last time, don’t mean to endorse this blogger beyond his capturing the zeitgeist of the time with a good graphic. But you can’t pass up a good pic! After first insisting that the boom must continue ( Why the Real Estate Boom Will Not Bust—And How You Can Profit from It by the Chief “Economist” of the NAR), then trying to misdirect away from early bad resale results (“They Overpaid”), then trying to dispute the validity of repeat sale indices such as Case-Shiller, finally the evidence of a market downturn was undeniable. Lets moot whether or not inventory is lagging or leading. 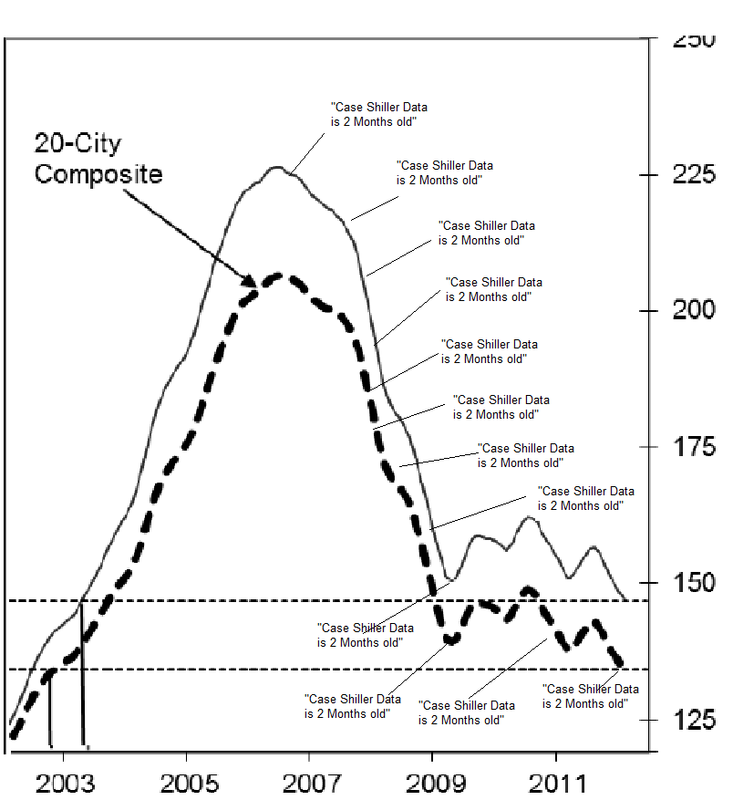 Case-Shiller has a lag of at least 2 months (and probably much more). The nod towards some lagging indicator is just misdirection to get you to look away from the question of whether you can trust the ‘boots on the ground’ information that you are being given about current conditions. All those reassurances of an imminent turn for the better only served to sucker people into a declining market. We’ve seen the same pattern this time around. People claimed that prices would never stop rising unless: we all give up our cell phones or there’s war with North Korea or millennials give up on cities… Then the apples were “cherry-picked” or “outliers”, then Case-Shiller dropped. Among other odd ramblings, you put quotation marks around a 72 month slide concept. Do you feel that was earned, in some fashion? Can you elaborate upon your wording choices? North Korea, triple exclamation points around a second, invented, quotation etc. Why? What is your problem with someone saying the market seems to be turning, right now? This spring? What bugs you about that, that you’re not capable of using normal language without resorting to hysterical, hyperbolic language? Firstly, there are quotation marks around that fragment about the craziness of wrongly claiming that the market had turned for 72 months in a row, because it is in fact a quotation. i.e. The writing of the linked blog author and not my own. Secondly, I had chalked some of posting issues up to technical difficulties. Three of my posts from yesterday simply disappeared into the aether. The one above resurfaced a day later. In the long past you would sometimes see a message telling you your post was being moderated, but now sometimes you simply click “post” and the page re-loads as if nothing has happened. Thirdly, you can say ‘the market is turning up right now’ all you wish. I’m just pointing out that during the last downturn there were a chorus of voices from coast to coast crying that all the lagging data should be ignored and “just now the market is turning up”. The industry chorus was singing this tune for the entire duration of the downslope. It’s one thing to have an opinion about the future. But when you mis-represent the present for 72 months in a row, it completely destroys any credibility you might have. I see. Well, there was nowhere near a 72 month slide in SF, more like half that at most. So are two or three months inside of 3 or so years always not going to have meaning? I’d say no. I think most people would say no. Anyway, boots on the ground or anecdotes or whatever. I’m looking at things that did not sell last fall that are selling now and I’m looking at apples trading for more than they did in avowed peak years. And remember, many sections of the SF marketplace will not even appear to have had a price shift from late last summer, fall, and up to a few weeks ago. It was scuttling along near all time price highs with lower volume. For me, this spring is going to resemble a spring 2007 type market, with both a lot of volume and high price. We’ll see though. I could be wrong but this is what I’m seeing right now, and it’s a quite a marked difference. The Great Recession era downturn in San Francisco actually started in mid-2006, effectively spreading from the southern neighborhoods north, with the top-tier peaking in the first half of 2008 and lasting through early 2012. That’s roughly 6 years from start to finish. Or a 72 month span, give or take a few months. Of course, there were those who confused a typical seasonal “spike” in San Francisco sales activity with an actual rebound back in the first quarter of 2009 (which would have shaved a few years off the actual cycle). Regardless, we’re always interested in good apples, especially those which previously traded in the later parts of 2015 and show a significant change, in either direction, since. And price cuts, which are up, are having an impact on sales volume. How can you posit the downturn started in 2006 when 2007 quarters include all time high prices? Of course, there were plenty of people who dismissed the leading indicators and completely misread the downturn, leading to such dismissive declarations as: “Scare tactics are dead. 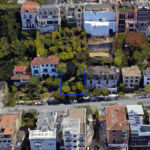 San Francisco never really took a price hit and it won’t, either,” circa mid-2008 and in response to our post about a concerning comp for a Ritz Carlton condo at the time. Sound familiar? Gotcha. So it didn’t start in 2006 at all. I seem to remember some people got the southern neighborhoods dead right and did great business in the midst of it all, right there, while others merely talked about things online. Actually, you don’t. Once again, values in the southern neighborhoods peaked in mid-2016 and were already on the decline in the second half of that year. The middle market followed in 2017. And the top tier was dragged down in 2018. Because concurrent with the subprime crisis, San Francisco and surrounding had the cosmic luck of being the locus for the monetization of the internet. And San Francisco shifted southward causing many things to happen in many, many ways, all during the subprime crisis. It’s hardly unusual for the beginning of a decline to be at an all time high. When you are at the top of a steeply sloped mountain, of course you are at the highest point around. But that doesn’t mean you won’t start tumbling downhill as you walk away from the peak. “and did great business in the midst of it all,” Perhaps you are the one who has been “Gotcha”‘ed? For a salesman, doing ‘great business’ selling people houses before or during the biggest housing downturn in US history might be great business indeed. But what of those who bought in on the edge of a precipice? Also, note that the pattern of the low tier overshooting relative to the middle and high tiers was not unique to SF, so is unlikely to be the result of and locus of anything or southern shift. Indeed even this cycle the tiers seem to be seperating in similar fashion. I’m not sure there is a consensus as to what causes this. The breakpoints are not the same between cities which complicates comparisons. For Minneapolis, the mid & high tiers moved closely but on the other hand the price difference between then was small. We all did all right, actually. Never put anyone in a bad deal, ever, once in my career. Betting on appreciation, or not factoring in market risk, is not how I approach these things. I don’t find your brand of bearsplaining particularly interesting or sincere either, for that matter. That’s correct. Which is why it’s expected. And typical. I have a hard time understanding what model would take the underlying data and be able to construct those trend lines. Seems to really distort the one glance take away. It’s a basic polynomial function. As we expected, while inventory levels have been on the rise, home sales in San Francisco hit a 10-year low last month, both seasonally and in the absolute. And once again, pending sales in the city remain down.